Like for so many of us who look to our gardens to help us heal, I often find life lessons in my garden. This week, I am reminded of the ability in nature to persevere. Almost against nature herself there are Siberian Irises blooming in my garden today, November 2!!!! Not just one little sad pathetic iris all by itself but 5 – 6 large, robust irises in bloom. Here is a photo of one of the best. You can see in the out-of-focus distance the fall color of a cherry tree. Why is this iris blooming in November? Someone out there knows the scientific answer. But I know the “real” reason. It is here remind me to persevere, and to attest to the fact that one can blossom when one wants to, and not only, or ever, just when it’s expected. To take a cue from nature that we can bloom pale spring blues and purples and whites amid the vivid reds, yellows and orange fall colors because we want to, and it’s OK , we can be ourselves, we can show off our colors anytime of year. That rather than being quelled or ignored for being different for doing our own thing, we will be celebrated. 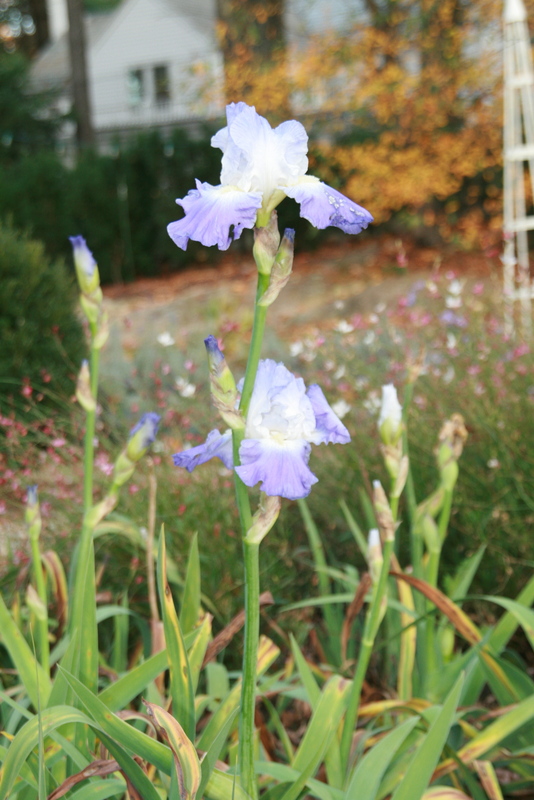 The unexpected presence of the irises in November brings forth gasps of delight from everyone. No one would ever think to cut down the iris and say “you don’t belong here at this time of year”. Despite going against the expected the iris are celebrated, praised and enjoyed. When I told my daughter in an email about the iris she wrote back “Your garden constantly amazes me.” I can’t help but equate my iris episode to life lessons. Again and again and again we are told “ ‘it’ will happen when you are ready” . And here it is an example in nature. So go ahead, bloom when you are ready. Constantly amaze us, please! writings of a plot holder, gardener, serial hair dyer and poet.